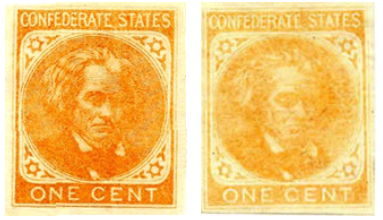 These stamps were printed and delivered, but never issued. Even though the printing number was low, the stamps are not particularly rare because most survived. There was a one-cent rate for drop circulars and effective July 1, 1863 for all circulars, pamphlets and periodicals not exceeding one ounce in weight. The stamps appeared on the Confederate Post Office stamp order form, indicating they were held in inventory at Richmond.